A crisp winter’s evening. 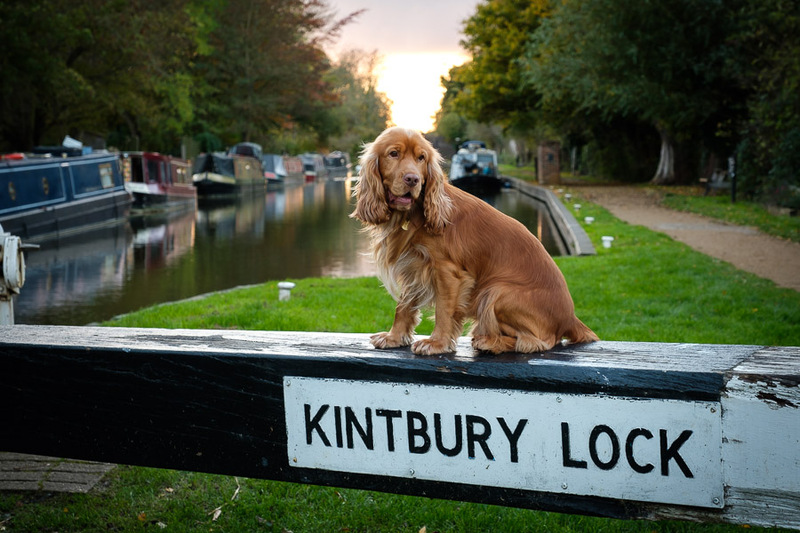 Your dog is basking in front of a log fire in the snug of a pub whilst you’re devouring a delicious Sunday roast after a long canal-side walk. 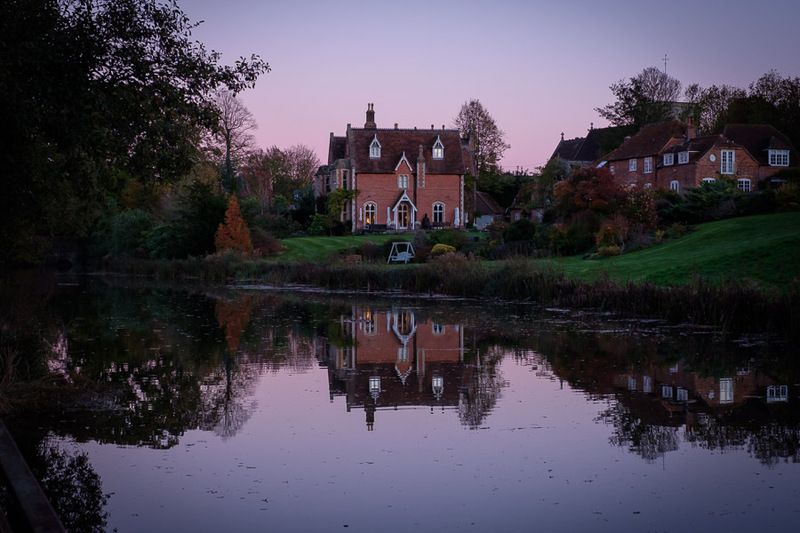 After dinner, you’ll head off to your riverside room and sleep blissfully until it’s time for breakfast and another long walk in the Berkshire countryside. Don’t mind if I do! 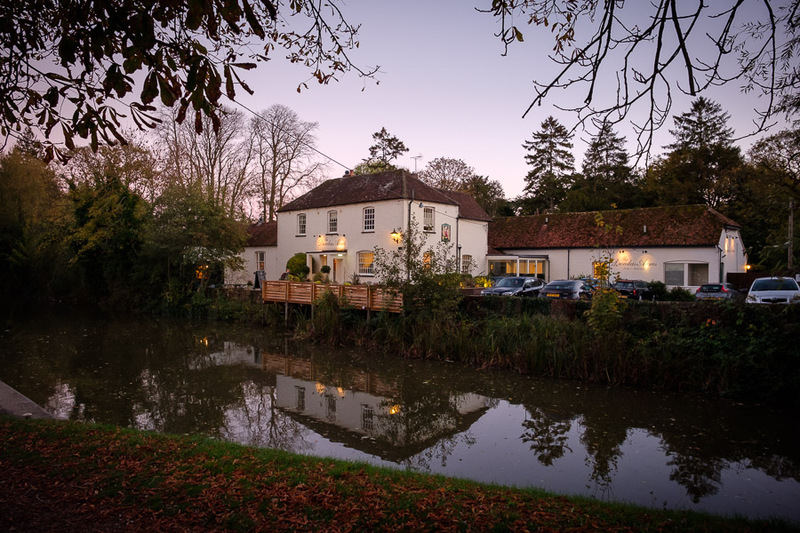 We recently spent a weekend night at the delightful Dundas Arms in Kintbury, Berkshire – and it’s a dog-lover’s dream. 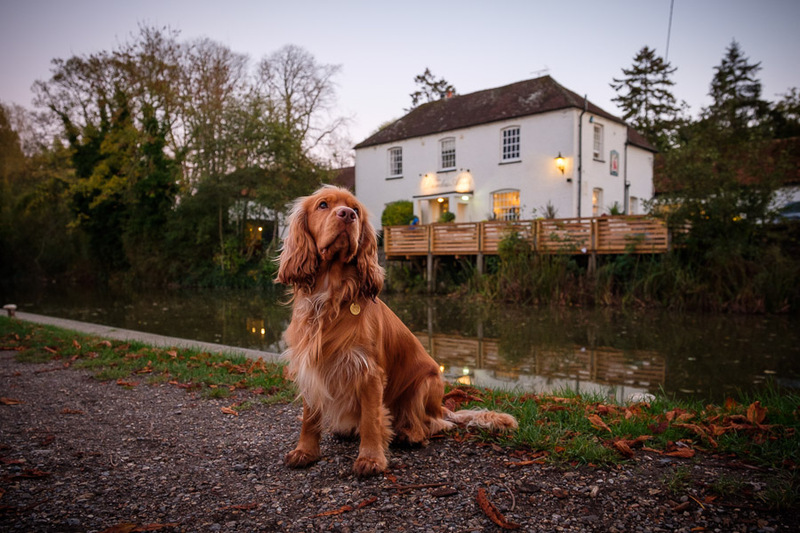 All eight rooms in the Grade II listed Georgian Inn are pooch-perfectly dog-friendly and, set in between the River Kennet and the Kennet and Avon Canal, there are plenty of waterside walks in the vicinity to enjoy. 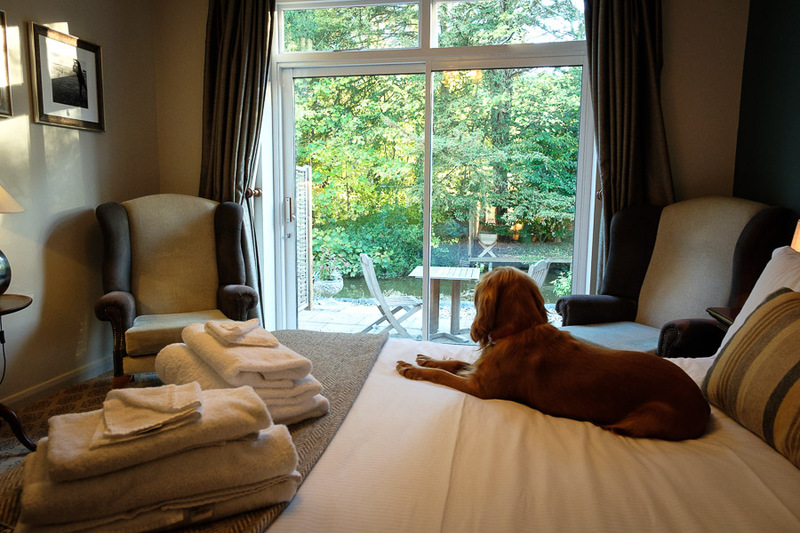 We arrived on a Sunday afternoon and settled in to our lovely room overlooking the river. Most of the hotel is newly refurbished in smart heritage colours. 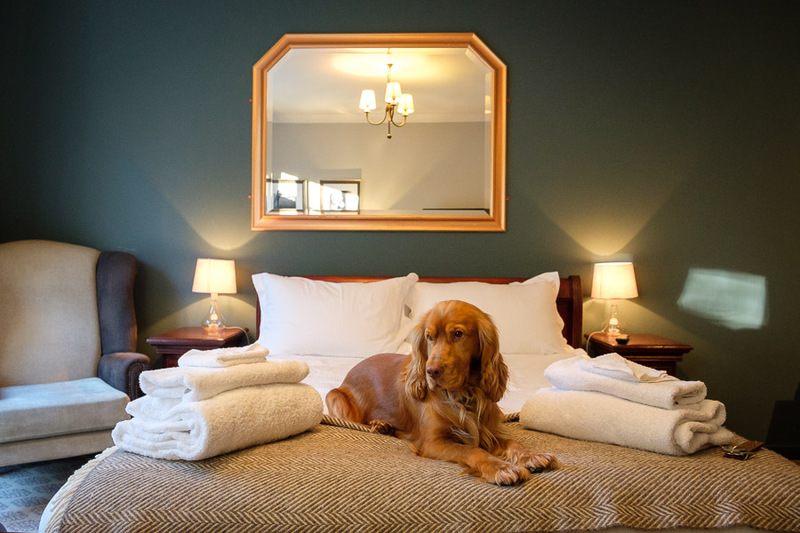 Barney quickly bagsied a space on the bed – though there was a dog bed provided especially for him in the room which he knew he’d eventually be banished to. There was also a bottle of dog beer gifted his highness. Hic! A pretty private terrace outside our room overlooked the river – which would have been lovely to sit out on to enjoy a coffee or an aperitif in warmer weather. 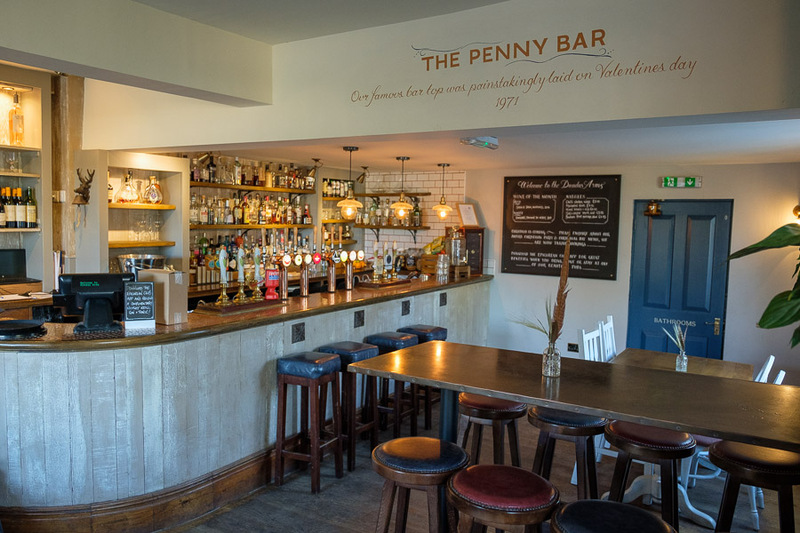 After settling in, we headed to The Penny Bar for a drink. The bar is so-called as it’s covered in pennies – as you can see from the pictures, it’s quite lovely. There were plenty of other dogs in the bar, so Barney felt quite at home. After a beer and a delicious rhubarb gin served with ginger beer (my new BFF on the drinks’ front, perhaps!) we headed out and about to explore the area with a walk along the canal. 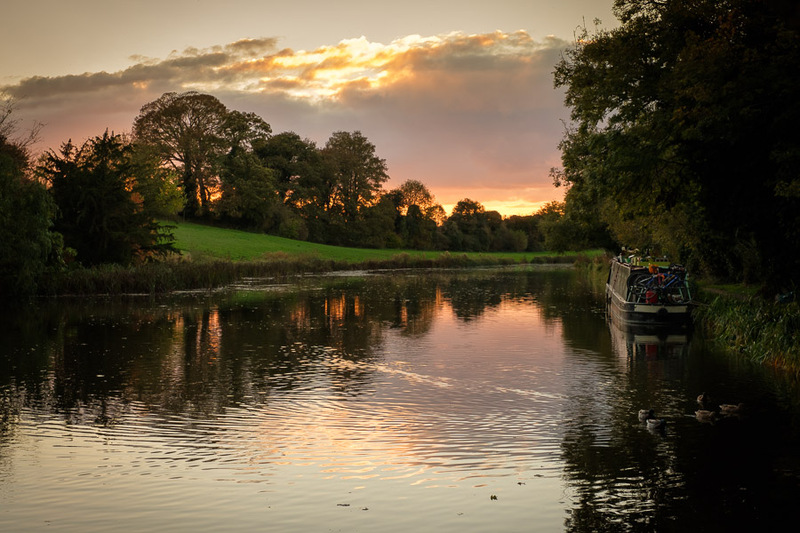 You can ask for suggested walks and routes at hotel reception – so you can be out for as long as you want..until the sun sets. Back at the hotel we headed for dinner. 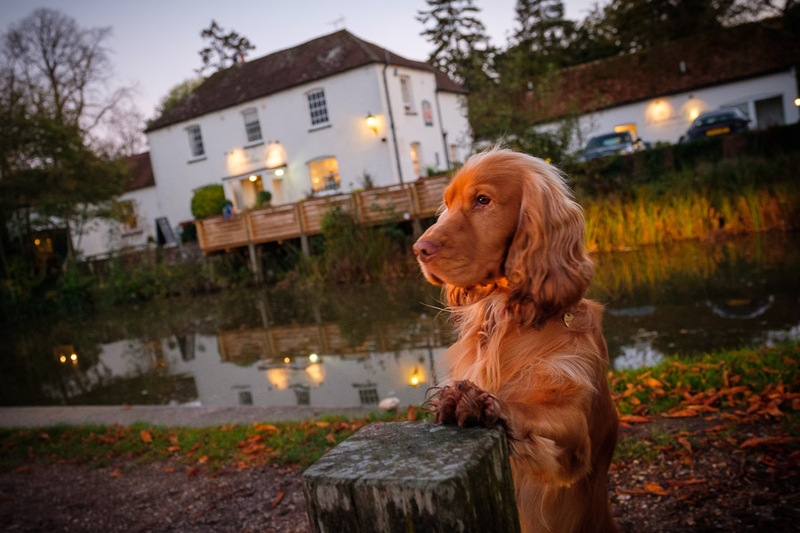 You can eat without your dog in the Garden Room restaurant – or with your pooch in the bar or snug. For starters, we chose hot smoked mackerel served with sticky onions and horseradish potato salad plus a twice-baked cheese souffle with a pear and hazelnut salad. Then it was on to a full Sunday roast – beef with all the trimmings. For dessert, we opted for St Clements creme brulee with orange shortbread and a selection of British cheeses with homemade chutney, grapes and crackers. It was all very comfortable and relaxed, with Barney sitting alongside us in front of a cosy fire. 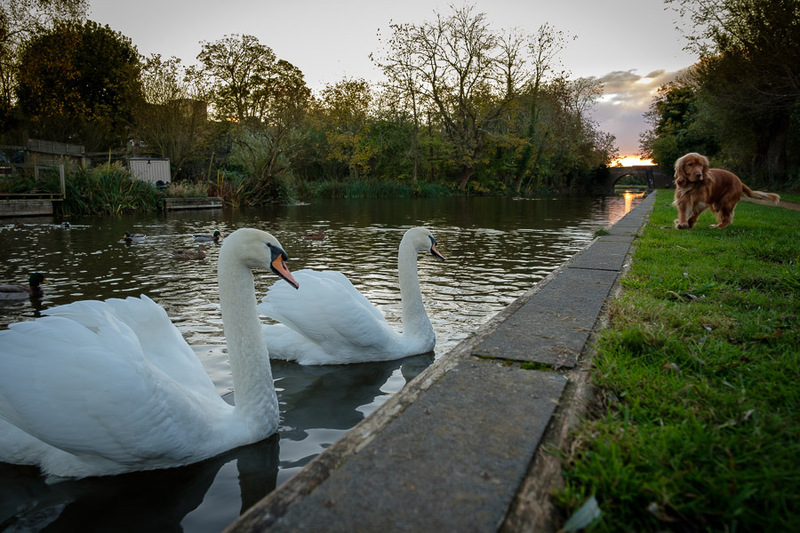 Next morning, after a great breakfast, and a little exploration of the pub’s gorgeous waterside garden, we headed off back onto the canal towpath for a walk. We really enjoyed our stay at the lovely Dundas Arms. 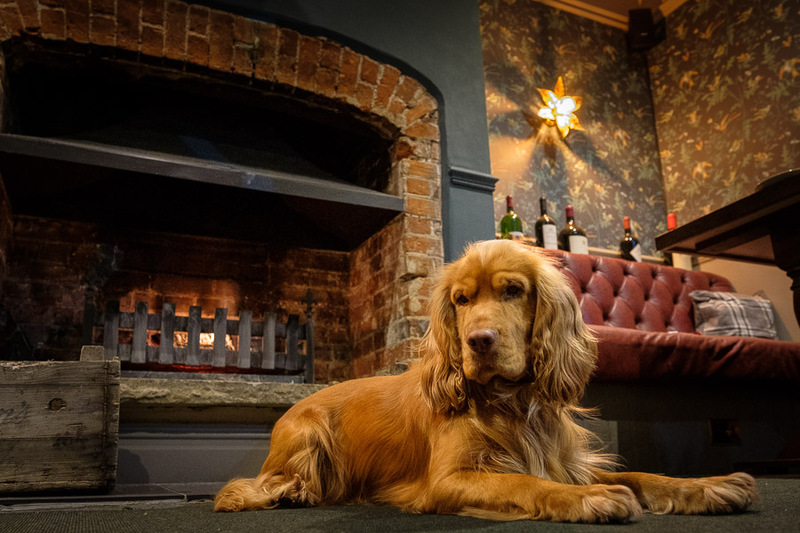 Cosy and convivial, stylish and welcoming, it’s a pooch-popular pub with class and a country-house hotel feel.